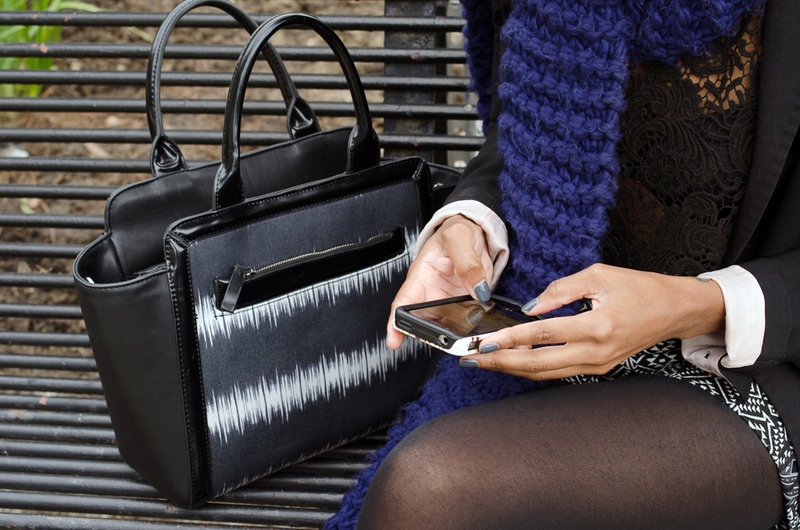 Cooler weather means warmer layers… or does it? I’d argue no. One of the first things I learned when I moved to NYC was big bulky sweaters and jackets don’t always do the trick when it comes to staying warm. The Georgia girl in me—who’d only seen snow once or twice in my 20+ years—always thought the bigger the jacket, the better! Boy, was I wrong! I’d see seasoned New Yorkers walking around in jackets that were much thinner than mine and yet they looked far warmer. What gives?! I quickly learned that it’s all about layering and thinking smart. This outfit is the perfect lesson in strategic warmth. The only time I ever regret cutting my hair is during the cooler months. You don’t know cold until you’ve walked around in freezing cold wind with no hair on your head! It will seriously have you rethinking your life decisions. Lol. But always remedy that problem with a hat. This one I bought from Topshop my first year in NYC. 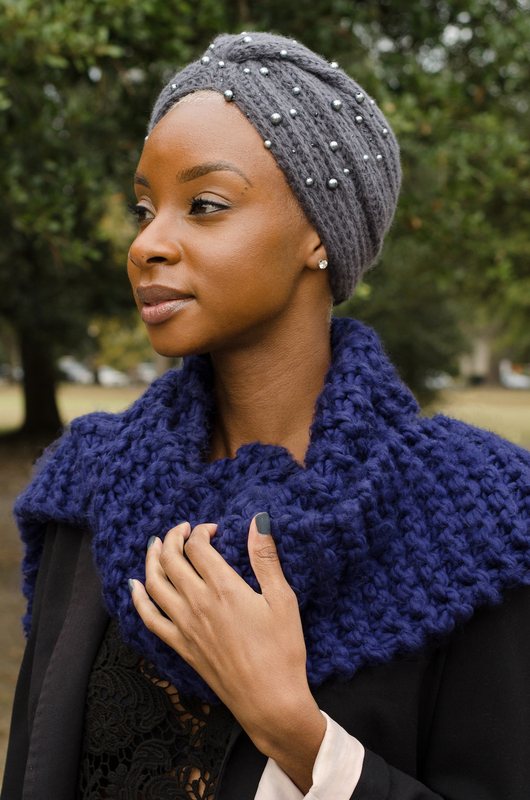 I like the beading on it, because it’s the perfect way to accessorize and keep the visual interest even when your hair is completely covered. Win/win. Now you guys know me…I can’t never wear enough black. 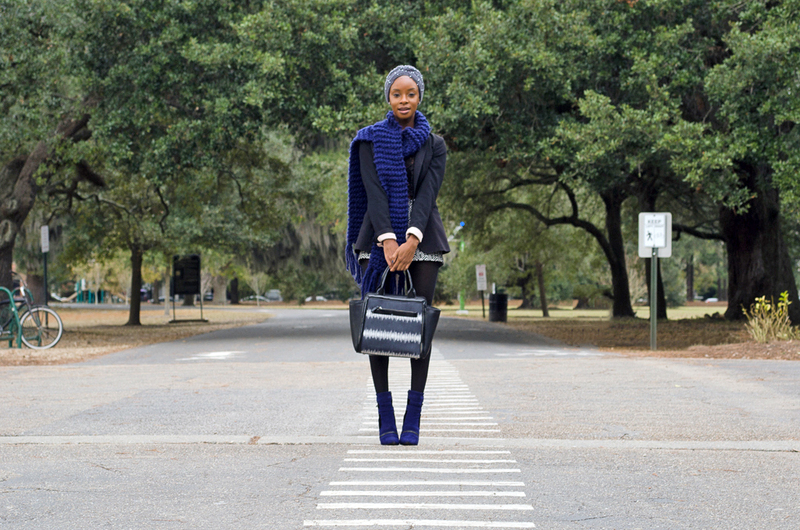 But these cobalt blue booties from Shoedazzle are the perfect pop of color for an otherwise dark palette. I’m obsessed with them! Tight plus a thick, chunky scarf to keep my neck warm (my grandmother would be so proud!) and I’m good to go! Short shorts and a lace crop top… it’s nothin’. You look great; very cute outfit. I like the touches of blue and those booties are hot! Why you so damn cute! Yay, for black being the new black; I thought it was just me — I can’t wear it enough! Love those shorts.